All books using the keywords: Dr. Robert L. McGowens, Sr.
Family Matters Dr. Robert L. McGowens, Sr. Many marriages today are in trouble because we have been going to the wrong sources seeking answers, and we have been following the wrong teaching when it comes to what marriage should be. We have allowed Hollywood to define for us how marriage life ought to go. God views marriage as sacred, and HE expects marriage to last. Happiness is a choice. You have to decide to choose to be happy. Don't wait on your spouse to act right to be happy. Decide you will be happy in spite of his or her actions. 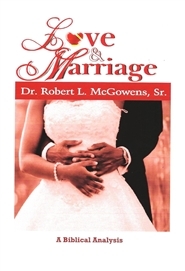 Heaven At Home Dr. Robert L. McGowens, Sr.
Love & Marriage (A Biblical Analysis) Dr. Robert L. McGowens, Sr.
Principles of Love & Marriage are great for any relationship, as they help us better communicate with each other. Love & Marriage (A Biblical Analysis) From the author of The Real Flavor of Love and The Dating Game, The Love Doctor is at it again with Love & Marriage. 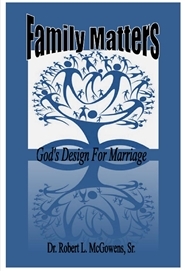 The latest addition to the "Family Matters" trilogy is a msut read. Love & Marriage is the Marriage Manual for the 21st Century! Dr. Robert L. McGowens, Sr., carefully narrates the duties of husbands and wives and their decision to honor God thorugh their marriage as directed by the WORD of God.